The Weatherhead T-420 crimps from 3/16 to 1-1/4 inch one and two wire, and four and six spiral hydraulic hose. Crimp diameters are set for Weatherhead style fittings. Crimper includes eight dies (collets). 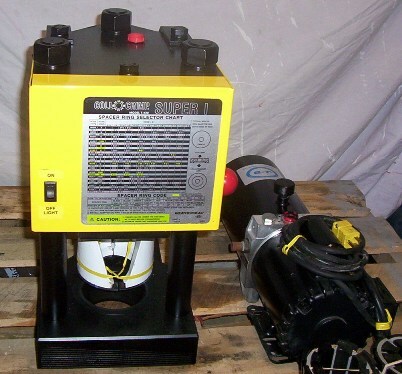 The Coll-O-Crimp Super I is a versatile machine ideal for your shop, factory, construction or mine locations. Big capacity combined with lever activated crimping gives you wide coverage and a quick and simple way to make factory quality hose assemblies. 3/16" I.D. fiber braid through 1-1/4" 6-spiral hose. 430 'E' Series Collet - 3/4"
430 'E' Series Collet - 1"
430 'E' Series Collet - 1-1/4"